The pain can no longer be suppressed. The fingers, inflexible, are torn open and so swollen that they will barley fit into the tiny pockets or sharp underclings. Andres Bindhammer is in a battle. A battle between himself and `PuntX´ a 9a+ (5.15a) which is in his words an “ultra-resistant route” in sector Deversé near Nice. A very challenging route, but in the end he will win the day. From childhood on Andreas Bindhammer, the elder of the `Hammerbrothers´, has approached tasks with this same persistency. On Christmas Eve 1985 the then twelve-year-old unpacks a yearbook of the German Alpine Club DAV. For days he rereads descriptions of sport climbing routs, which captivates hours of his attention. This is the beginning of a career on the trickiest walls of this planet. 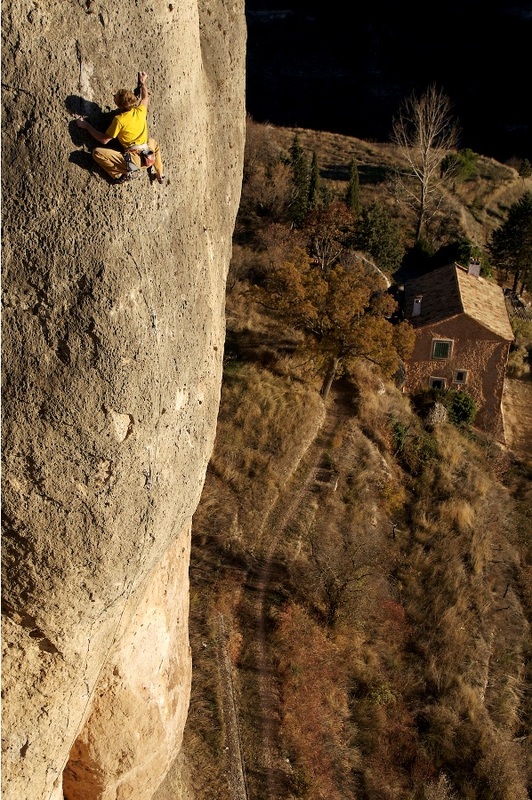 In 2007 he manages to repeat `La Rambla´ as the first German climber to send a 9a+ (5.15a or 11+); his first ascents include `KinematiX´, 9a (5.14d), an extreme classic route in modern sport climbing. That same year he is also the first German climber ever to be nominated for the Rock-Legends-Award, the `Oscar´ in climbing sports. While hiking on family holiday, the teenager is spellbound by some vertical 500 meter walls. He is eager to scale them but doesn’t know how to, he only feels a strong desire burning inside. He convinces his father to take him along on alpine routes and to climbing gyms. Andreas improves on a rapid pace and with 15 he hits an unexpected problem. He has leveled up to where no one in his surroundings can teach him how to get better. In the end the DAV squad team makes it happen. From this time on, progress is unstoppable. Christian Bindhammer is inspired by his elder brothers´ passion and in 1993 the `Hammerbrothers´ participate in their first competition. In 1995 Christian wins the Youth Championship, Andreas the German Championship. Four years later he is placed third in the UIAA Climbing-World Cup in Wiener Neutstadt, Austria. For years the brothers focus on competitions and therefore train exclusively in climbing gyms. Then, all the sudden, Andreas is tired of Indoor. Given that he found his climbing enthusiasm in nature, he now feels locked in and consequently demotivated. His wish is to climb rock again. He also increasingly becomes aware of the necessity of money-making. Only the winner gets sponsoring, but not even winning pays the rent for a climber. Together with his brother Christian he creates the company MasterRange Equipment. The manager duties that he is now bound to consume lots of time and complicate the ideal preparation for new projects. “I should be concentrating on new routs all the time. And that’s what I would rather be doing”, the pro says a bit nostalgic. As a studied architect and having an artistic talent, he can on the one hand enjoy the hours in which new climbing surfaces first grow before his inner eye and then are shaped on his computer. On the other hand, to run a company you need to do more than design. Accounting is just one example, customer acquisition and leadership are also necessary. In this field, Andreas also takes advantage of his persistency. Just like working a route and finding the best way through, he keeps turning the parameter of MasterRange from time to time, asking himself how and what to improve or innovate. Now that the euphoric high in which the brothers won national and international titles one after the other has worn off, Andreas prefers his rock climbs before all; since: “To climb on rock is for oneself and for good”. The person succeeding the first ascent of a route will always be associated with it. With competition results achieved indoors, one obtains great satisfaction and sponsoring, but of transitory nature. Another competition, another probation. It´s a never ending rat race. The latter can certainly also be applied to rock climbs. But rock demands more persistency. The psyche of the climber is not only challenged during the moments in which the audience watches closely, at times over big screens, who will win the day, the champion or the contender. Outside it can take hours, days, weeks, months or even years until the first ascent is completed. Especially at Andreas´ level: 9a+ (5.15a). For instance, he had already checked out `PunktX´, 9+ (5.15a), directly after sending `Abysse´, 9a/a+ (5.14d/5.15a), back in 2006, but the moves seemed a bit too difficult. “I could barely clip the quick draws”, he remembers. That got his dander up. For months he would only boulder, and meanwhile he works out a new strategy for the next attempt. “My plan was to give it a maximum of four tries on the first day, then go bouldering the next day in Annot, a close-by sandstone bouldering area, rather gentle for the fingers, and after a rest day give it some more tries in the route.” Mid September of 2008 – the same year of his other two first ascents `St. Anger´, 9a (5.14d), and `Hades´, 9a (5.14d) –time is right. All the sudden he´s at the top, beset with sore, maltreated fingers. He crowns the success with a yelp of joy. It´s like a never ending walk on the tightrope: your physical record must be ready for action, precisely when the conditions are right. Sometimes a certain amount of anger that piles up with every failed attempt can help. A sort of sacred anger. On the nearly 20 meter route you work through 28 moves without any resting position. The first 13 moves are very athletic and demand a high degree of body tension, comparable with the hardest moves of an 8b+ (5.14a). Then the crux: an extremely hard to coordinate dynamo into a shallow, hidden hold. Hard training during a long winter, focusing on the campus board and bouldering sessions enables the ascent on March 22. Andreas gives away that his favorite band Metallica inspired him to the name. He admires the musicians because he makes out similarities to himself: “Their music has the same energy like 20 years ago. That’s exactly how I understand the climbing sport.” He still challenges himself with the same enthusiasm as back then. A pioneer on rock, Andreas proves himself visionary with the foundation of his company. MasterRange fills a market niche in Germany. He managed to transmit his climbing passion to an occupation in which his enthusiasm reaches many sportsmen. Be it with the conception of climbing gyms, with multifaceted and diversified route setting, the sale of top-end outdoor products or by passing on knowledge in the context of courses. This connotes indeed that he always takes his notebook along to his own projects and that at night paperwork is waiting for him on his desk. Still, Andreas managed to create a symbiosis between career and calling that is based on passion to rock.